Aircraft Spruce's complete product line is available at www.aircraftspruce.com. Request your complimentary copy of the company's free 950+ page catalog (available in print, CD, or PDF formats). The Clecall Company has developed a new type of Cleco pliers and it claims to improve efficiency and ergonomics for a tool that's used by almost all homebuilders. Continue reading "New Upright Cleco Pliers"
The new battery-operated tungsten grinder from USA Weld is portable and easy to take to any job. It offers six speeds, ranging from 8000 to 30,000 rpm with a digital display, and puts the perfect 2.5 degree point on the tungsten electrode each time, the company says. The grinder is available as an adjustable model as well, with all the features of the company's standard grinder, plus the ability to adjust the angle, or the point of the tungsten, from 10-30°. Standard or adjustable, both grinders include 1/16-inch, 3/32-inch and 1/8-inch collets, all enclosed in a convenient carrying case with the battery charger. Both versions of the grinder are also available as 110-volt models. Prices start at $269.95. For more information, visit www.USAWeld.com, or call 800/USA-WELD. Now you can shift from slotted to Phillips to Torx or square recess without ever touching the bit of your screwdriver: The new Worx SD SemiAutomatic Driver features a six-slot revolving chamber that rotates screwdriving bits in and out as needed. Inside the tool’s body is a rotating circular cartridge that holds six 1-inch, hex-shanked bits. Draw back the magazine (cover) to advance a bit into the chamber, then slide it forward, and it’s ready to drive screws. If a pilot hole is needed, there’s even a hex-shanked screw starter drill bit. The Worx SD SemiAutomatic Driver is powered by a 4-volt lithium-ion built-in battery. The plug-in charger brings the driver to a full charge in 5 hours. Constructed of nylon composite, the SD driver features a two-finger trigger, an LED light to illuminate the work area and a forward/reverse rotation button. The kit includes the SemiAutomatic Driver, two bit cartridges and 11 screwdriving bits: Phillips #0, #1, #2; Slotted #4, Hex #3, #4, #5mm; square recess #1, #2, and T10 and T20 Torx bits. Also included is a screw starter drill bit and 5-hour charger. The cost is $49.99, and it is expected to be available in October. For more information, visit www.worxsddriver.com, or call 866/354-WORX (9679). In the May 2008 issue of KITPLANES I included a photo of a mystery wrench and asked folks to write in with identification. The response was a bit surprising in that this introduction-to-machining series of articles is being read by a lot of tool and die maker experts. Some of the responses are shared below. 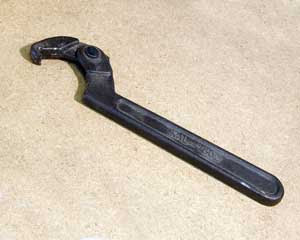 The tool in question is a "hook spanner" or just "spanner wrench." I ran a saw & tool grinding shop for 33 years. Nearly all our upright grinders (West German) used a "spanner wrench" to loosen/tighten the "ring" nut that held the grinding wheels to the spindle. They were marked in mm (millimeters) relevant to the outside diameter of the spanner nut. Yes, there were adjustable spanners, hinged mid point, so they could "span" several different sized nuts. I was born in Chicago in1926 to German parents. My dad was a tool and die maker for all his life. I was lucky to have a machine shop in the basement of our home. I truly enjoy your articles. Some things don't change with time. I have a tool very similar to the one on page 53. The handle is cast with the following information. J.R.WLLIAMS & CO. BUFFALO, N.Y. U.S.A. on one side. 471 3/4-2IN. ADJUSTABLE SPANNER on the other. It is painted in black enamel. I have had this tool for at least 60 years. My tool is as yours except that the pivot pin is flush with the handle. So, with that sort of expert readership, I’d like to invite you to share a tip or a tool with the rest of us. If I choose yours for the month I’ll buy you a one-year extension to your subscription to KITPLANES.